Gwanghwamun-gil is the small diagonal street between exits 7 and 4 of Gwanghwamun Station*. This traditionally messy area full of snacks**, restaurants, small shops, and office clerks flocking from Gwanghwamun Station to their towers, is evolving very quickly : buildings under renovation or destruction, old eateries giving way to modern franchises and new restaurants... another consequence of the Gwanghwamun revival. Gwanghwamun-gil's unusual angle betrays an old age and indeed, on all ancient city maps, it literally jumps at your face as the beginning of the biggest road West of the Gyeongbok palace. If you take a map of today's Seoul, you can easily retrace its path : you only have to remove Sejong Cultural Center, which was constructed over 30 years ago, to see the diagonal continue Northeastwards all the way to Inwangsan's old fortress. The Northern section of the old road (about 1.7 km between Gyeongbokgung Station and Jahamun Tunnel / Buam-dong) is still clearly visible : that's Jahamun-gil, Seochon's main vertical road. Back to the Southern, 800 m long "Gwanghwamun" section now : between Sejong Cultural Center and Jahamun-gil, the street splits into twin alleys named after local dongs (Dohyeon-dong-gil and Naesu-dong-gil) until it meets with Naejadong-gil. It then becomes a narrow path surrounded by office buildings, and reaches Sajikno between Gyeongbokgung Station exits 6 and 7. This diagonal looks quite thin nowadays compared to the horizontal lines of Sajikno or even Naejadong-gil, but these two roads were considerably smaller before the opening of Sajik Tunnel (the first tunnel ever built in Seoul was inaugurated on May 30th, 1967). Of great historical significance, the link between Gyeongbokgung and Sajik-dan stopped at the shrine : a founding street for the future capital city, but not exactly today's six lanes of traffic. Why was this diagonal so important then ? The biggest axis West of Sejongno simply follows Baekundongcheon (백운동천), the stream that becomes Cheonggyecheon when it meets Junghakcheon (중학천), exactly under today's Cheonggyecheon Square. More vertical, Junghakcheon flows down from Bugaksan, through Samcheong-dong, following the Eaestern walls of Gyeongbokgung. This stream left its name to Junghakcheon-gil, the street behind US Embassy, KTF and Kyobo buildings, parallel to Sejongno. - plus the small one coming from Gyeonghuigung, Gyeonghuigungnaesucheon (경희궁내수천). A bridge has symbolically been rebuilt in front of the Seoul Museum of History. All the waterway names have disappeared, but they sometimes pop up in ancient literature : Okryudongcheon (옥류동천), Daeunamcheon (대은암천), Malliroe rapids (만리뢰)... They might reemerge someday, just like the restoration of Cheonggyecheon marked the revival of ancient bridges. Because if both affluents are totally covered now, they may see the light again, like Cheonggyecheon itself. 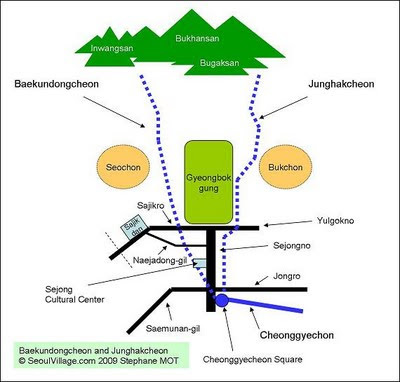 Seoul City already plans to reopen Junghakcheon, and Baekundongcheon should come next. Unfortunately, the first thing they will see is 'Spring' : the most regrettable 20 meter-tall seashell / DNA structure erected by Coosje van Bruggen and Claes Oldenburg... part of Cheonggyecheon Restoration's collateral damage. Imagine downtown after the restoration of its main streams and Seochon's revival... I hope it will be made with taste and consideration for yesterday's as well as tomorrow's Seoul : Seochon should remain alive, not turn into another Bukchon-style open air museum. 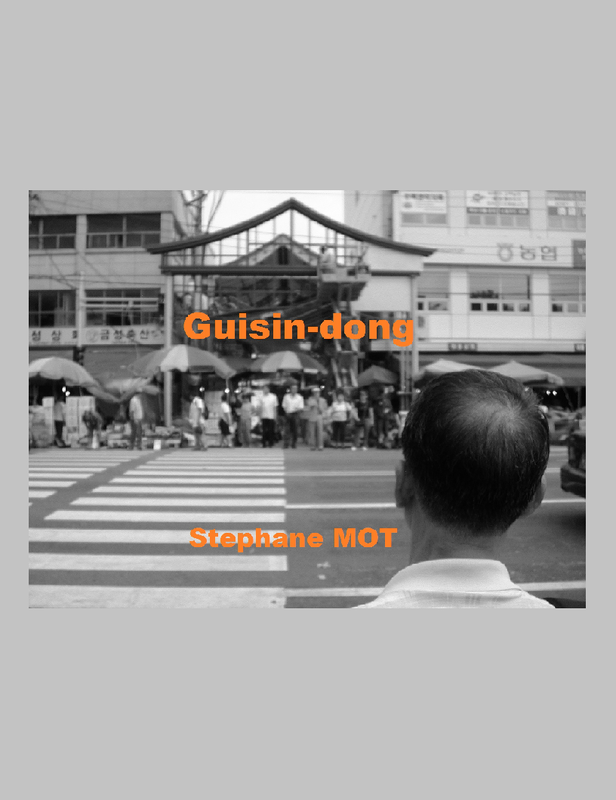 * from Sejongno Sageori to Sejong Cultural Center crossroads, where Sejongmunha-gil (perpendicular to Gwanghwamun Square) cuts Sejonggwandeuit-gil (which becomes Hyojaro to the North, the road to Cheonghwadae following Gyeongbokgung walls).